Ever wondered how to toast coconut? Making it yourself is the easiest thing to do! 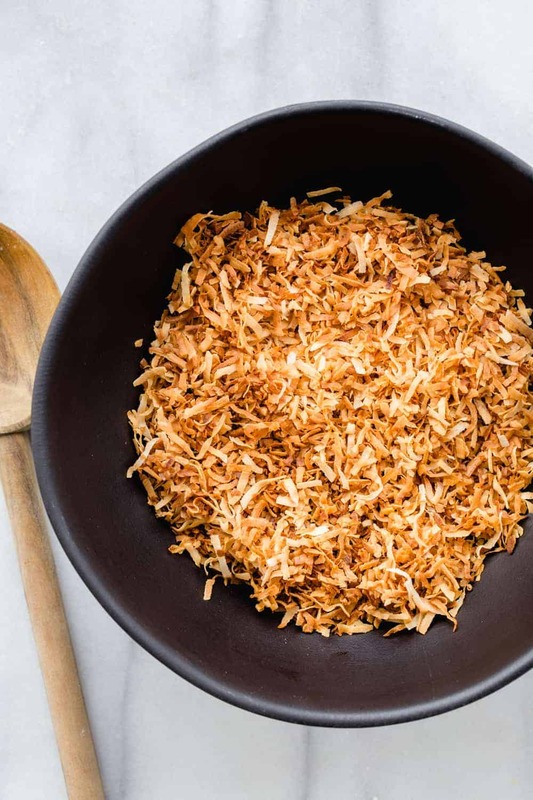 Toasted coconut is one of my favorite ingredients to add to baked goods. Although I love me some coconut straight from the bag, toasted coconut is definitely my favorite. Did you know that coconuts made their own way around the world? Of course, traders brought them with them on travels 2,000 years ago, but because it can float, it’s also thought that the coconut spread itself throughout the subtropics. I know that’s a little more history than I regularly delve into, but coconuts are pretty fascinating. And tasty. Plenty tasty. I find that coconut is one of those ingredients that most people either love or hate. I definitely fall into the love category. 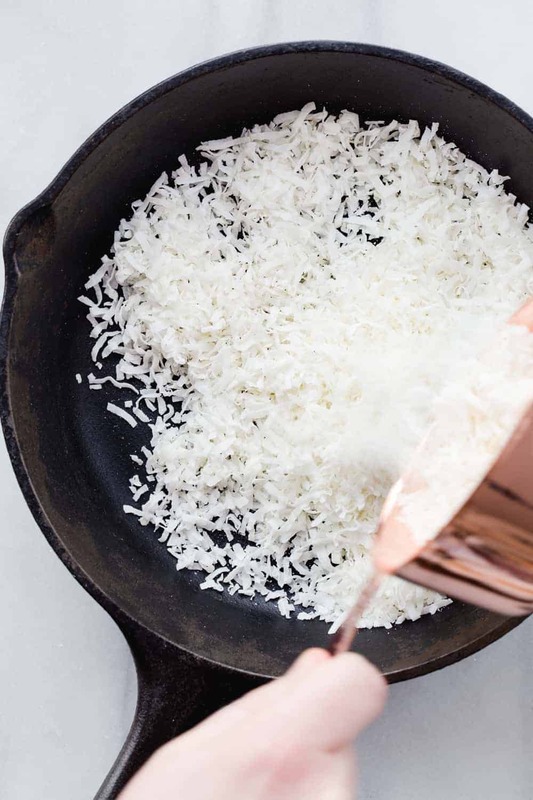 Toasting coconut is a lot like toasting nuts in the sense that it really adds depth and brings out a lovely nuttiness that adds great flavor and texture to whatever recipe you add it to. 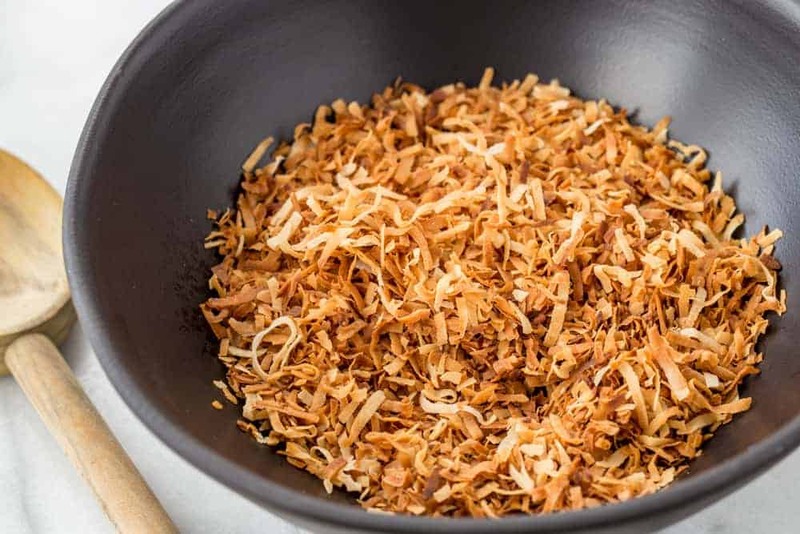 Sure, you can buy toasted coconut in most baking aisles, but it usually has extra preservatives to keep it fresh. I’d much rather toast my own, especially since it’s SO easy! 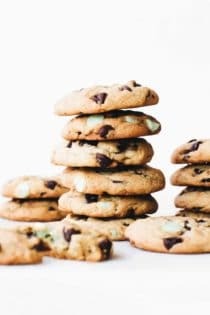 From these caramel coconut chocolate chip cookies and chocolate coconut zucchini bread to key lime coconut cheesecake, coconut is one of my favorite flavors to bake with, especially during the spring and summer months. 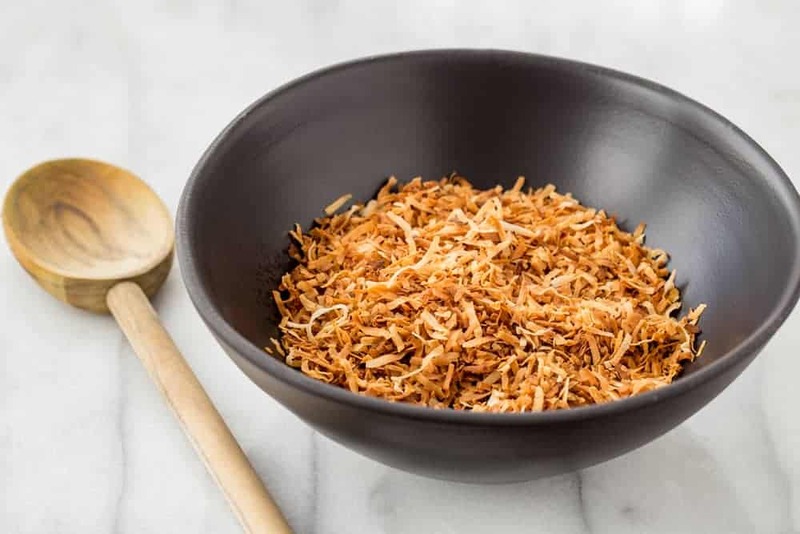 Toasted coconut can add flavor and texture to desserts like cupcakes, muffins, parfaits and bars, but it’s also fantastic in homemade truffles and mini trifles. I also love it layered in with Greek yogurt, and fresh berries for a delicious breakfast parfait. The coconut world is your oyster, and all it takes is a few minutes to toast it up. Let’s get to work! There are a few techniques for toasting coconut. You can use the stove top, the oven, and even the microwave. Personally, I am a big fan of the stove top method. I find I have a little more control, since I’m able to keep a constant eye on the coconut, plus frequent stirring allows for a more evenly toasted finished product, but the oven and microwave definitely do the trick too! Like I mentioned, you can actually toast coconut in the microwave and as you can imagine, it’s super quick. Start by spreading about ½ cup of shredded coconut on a microwave-safe plate. Microwave the coconut in 30 second increments; stirring each time. Continue cooking and stirring in 30 second increments until the coconut reaches the desired level of toastiness. Can you sweeten unsweetened coconut? 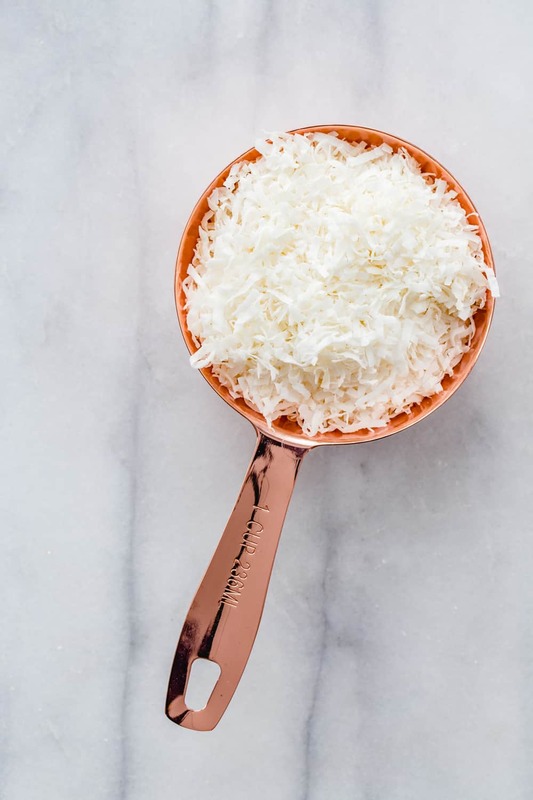 If you have unsweetened shredded coconut and would like to sweeten it up in a pinch, you can place a pound of unsweetened shredded coconut in a zip top bag with 2 tablespoons of powdered sugar. Give the bag a good shake and you’re good to go! I wouldn’t toast coconut after you’ve added sugar – the sugar might burn, and you’d end up with a wasted ingredient. 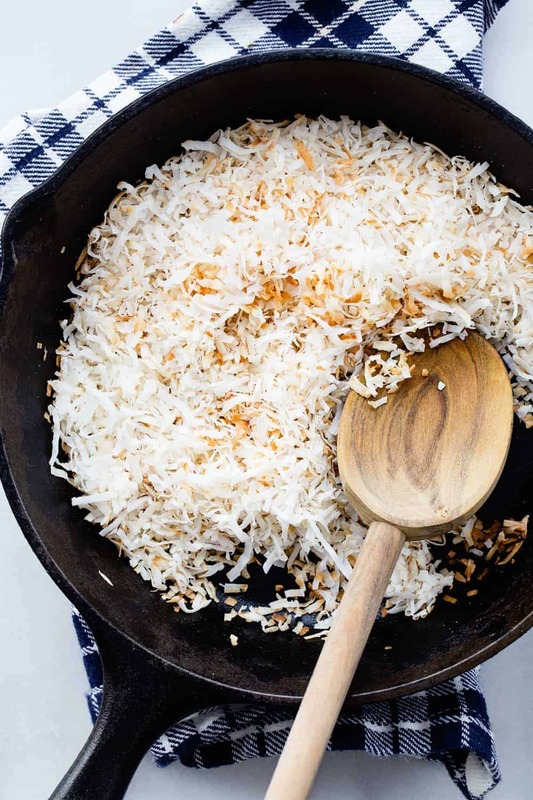 Place desired amount of coconut in a large skillet. Cook over low-medium heat, stirring frequently, until the flakes are mostly golden brown. If the coconut is sweetened it tends to brown faster so, it will take less time. Spread coconut flakes on a baking sheet in a thin layer and bake in preheated oven. The flakes will toast very quickly and won’t take more than 5-10 minutes. After a few minutes stir the coconut to help ensure even color. Remember, sweetened flakes will take less time because sugar speeds the toasting process. This post on How To Toast Coconut originally appeared on My Baking Addiction in September of 2012. The text and images have been updated. Okay, I feel weird. I’ve never toasted coconut in a frying pan. It never occurred to me! How have we never discussed this? 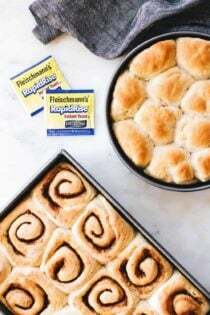 This is way easier than parchment paper, baking tray, and waiting for the oven to preheat. I feel like you’ve been holding out on me. Easy, peasy! Thanks for sharing. I didn’t know how easy it was to toast coconut! I want to sprinkle this toasted coconut all over my cakes! I toast my coconut in the microwave…and it works great. It’s the easiest method I’ve found and you just have to stop it every thirty seconds or so and stir it around a bit. Great idea, Amy! I may research it and add it to the post. Thanks for sharing. Very useful information. I enjoy using coconut in recipes from time to time so will be adopting some of the methods you’ve listed above. My preferred is also the DIY stove top method that you’ve described. Good topic – I love toasted coconut and use it for certain dishes (such as rice pudding sweetened with cream of coconut and topped with toasted coconut). I’ve never heard of toasting it on the stovetop, but I’m sure gonna try it next time! I never knew how to do this before, thanks!! That’s amazing! I had never heard about toasting the coconut!!! And everything you say is so right…I take your advice from now on ☺! Thank you and nice to meet you! I love your site internet!!! I’m going to follow you ☺! Awesome! Thank you! I will be toasting coconut for the first time for some cupcakes I’m making for a birthday party in a couple of weeks, perfect timing. Ironically enough, I have never toasted coconut and was curious the proper method a few days ago. Now I know so thank you very much! I’m sure something yummy will come of it. Thank You so much for the skillet method! I just toasted up some coconut and it was so nice & easy!! I am so glad you enjoyed this fundamentals post. Thanks for stopping by and providing your feedback – have a great day! I toast coconut and nuts in an air popcorn maker. A 1/3 cup of nuts or coconut toasts more evenly than the stove or oven methods. 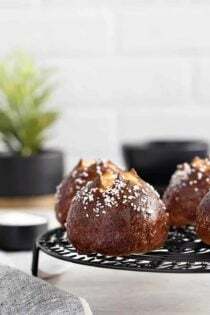 You also can watch the nuts or coconuts become gradually browner and the smell of the coconut or nuts will reveal when it is perfectly roasted. Bon Appetit. I too have never toasted coconut and need it for my pinacolada cake. Thanks for the info. 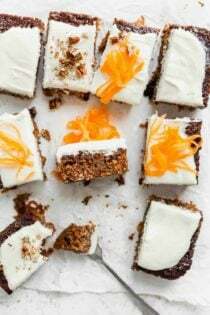 Easy cake recipe–angelfood cake mix to which you add 1can crushed pineapple. Pour into greased baking dish. Bake for 20 minutes. Cool. 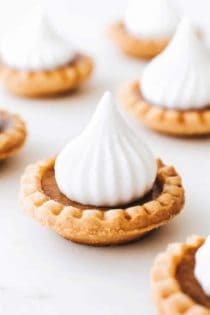 Spread with fat free cool whip and sprinkle with 1/2 cup toasted coconut. Refrigerated. Thanks for the recipe! Let us know how the toasted coconut is with the cake! 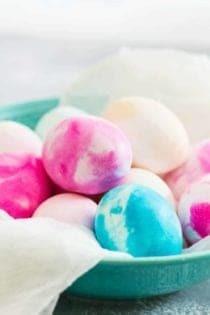 Have a wonderful day and thank you for following MBA! I am putting toasted coconut on a cake, if I refrigerate the cake, will the coconut get soggy, or will it keep its crisp texture? I think eventually the coconut might get soggy, but if you tried to put it on after refrigerating the cake, it won’t stick, because the frosting will harden. I think you’d have at least a day or two of crisp coconut, though. can i store toasted coconut? or will it get soggy? I WANT TO ADD SUGAR AND SALT TO THE COCONUT BEFORE TOASTING IT, HOW SHOULD I GO ABOUT IT. THANKS FOR THIS. Those cupcakes sound adorable! Thank you so much for stopping by and have a wonderful day! 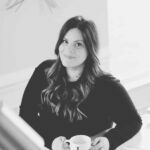 Hi, I just found your site and I think it’s going to be my go-to for baking questions, etc.! I have a question: I am making an apple cake (it’s called “Fabio’s Apple Cake”) and I have some left over toasted coconut from a jar of toasted coconut cashes (simply, incredibly delicious by the way). 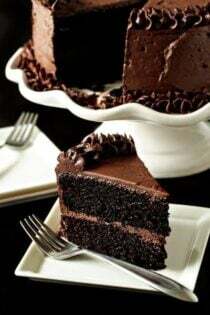 I want to put it on top of the cake. Since it’s already toasted, should I put it on the cake, say, the last five minutes of baking? Or put it on when I take the cake out? Thanks. Donna, I’d add it once the cake is out of the oven. Thank you, Jamie. It came out great – I added a walnut streusel on top and threw on a small amount of the coconut. I am making a coconut cream pie and it calls for whipped cream with a sprinkling of coconut on the top — would toasted coconut be better? Linda, in my mind, toasted coconut is always better. But I like the texture much more. It’s a personal preference. purchase 9″ keebler shortbread or flavor of choice pie crust. 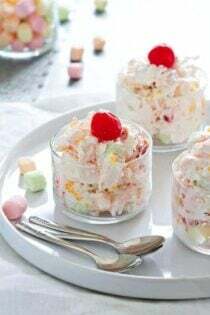 1 pack coconut creme jello pudding. make jello according to pie filling directions. pour into crust and refrigerate. add toasted coconut to top. yummy! Thanks for this! 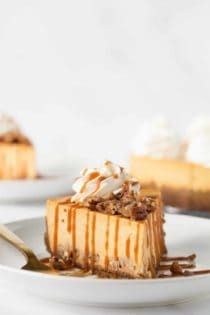 I’ll be using it to top a pumpkin cheesecake! That sounds wonderful. Thanks for visiting. You are a goddess!! I’ve never tried (nor heard of the stove top method). I’m going to try it this very minute! And the tip about sweetened coconut browning faster…who knew! Thank you! I’m glad this was helpful. Thanks for visiting. 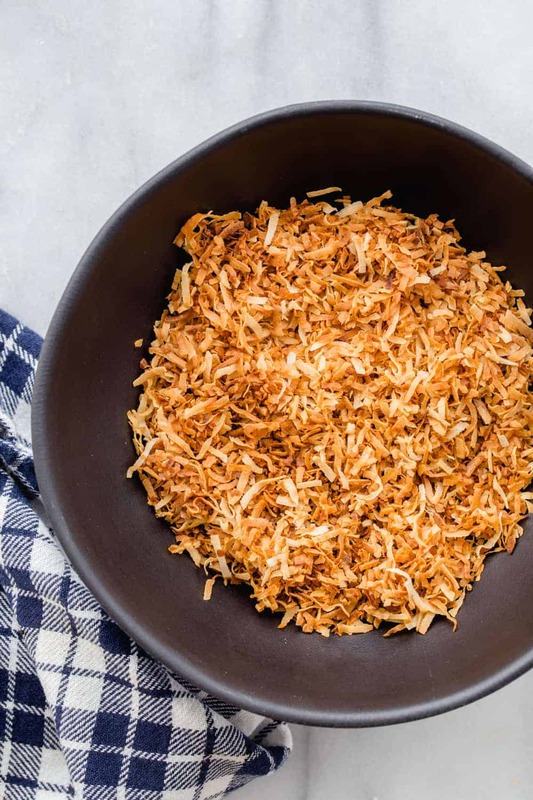 Do you need to refrig toasted coconut? 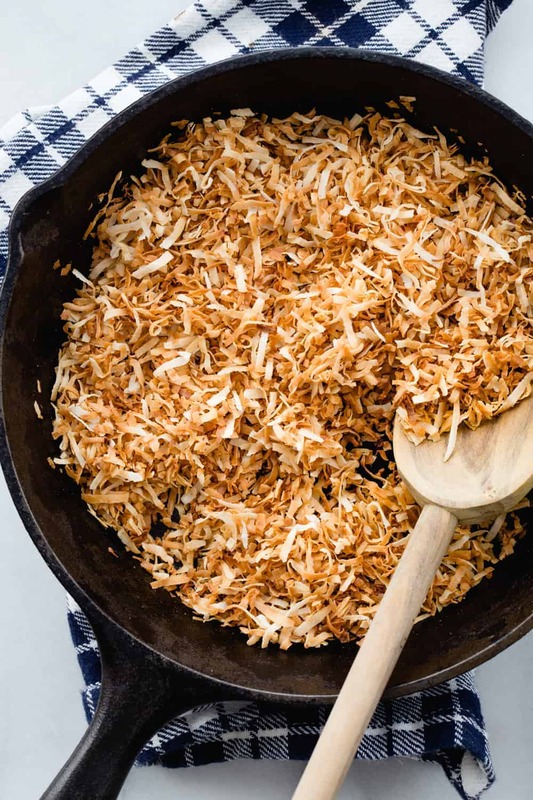 The toasted coconut should be fine at room temperature or in the refrigerator in a covered container. Can I color coconut before toasting??? I wouldn’t recommend coloring the coconut before toasting. I hope this helps. Hi. 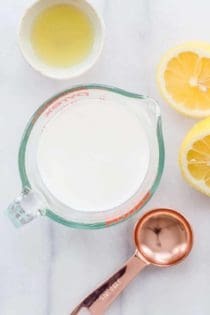 I am using unsweetened coconut. If i want to add powder sugar do we do it before we toast it on stove or after? Thank you in advance. I don’t know if we get coconut flakes in India. I’ll need to start with a coconut. I have a question – do you use dry coconut, also called copra or fresh coconut (not green coconut) with some water & husk outside? Just tried this, it came out amazing. Thanks for th tip. You’re welcome, Linda. I’m glad it worked out! How long do I need the coconut to cool before storing it? Hi, Jim! Cool the coconut so it’s room temperature. I hope you enjoy it! Hi, Thank you for the shortcut stovetop method. Just wanted to mention that if you use a skillet in which you cook food in everyday, the coconut will be infused with that smell. So either use a skillet dedicated for similar purposes or go for the oven method. The oven method just took me 3 mins without stirring. I just spread the coconut evenly on a baking sheet. Thanks so much for the tip, Anjali! Wow I thought it would be harder then this. Thank you! 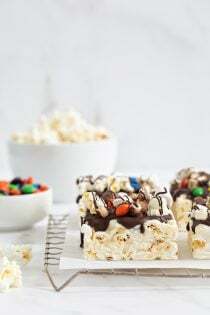 I will use this method for my dark chocolate coconut fudge. You’re welcome, Karleen! Enjoy your fudge! This is just perfect! I love using toasted coconut for decorations in cakes and desserts. It’s always delicious! It is the best! Thanks so much for stopping by, Natalie! Please don’t ban me from being a loyal reader, but I’m definitely in the hate category for shredded coconut, haha. Sorry! But it’s definitely still a great ingredient to bake with; and your toasting method is awesome! One of my best friends absolutely hates coconut anything, we’re still cool! I have made your Chocolate Chip Caramel Coconut cookies several times and love them. However I did not toast the coconut first. Should I?? Hi! Can you use fresh frozen coconut that has been thawed and dried with a paper towel? thanks! So to answer my own question from earlier- since I decided to give it a try- No- you can’t- at least I couldn’t …I tried the stove method from above and while it got almost all of the leftover moisture out- it didn’t brown that pretty brown color and didn’t get crunchy or that yummy smell to it that shredded coconut does. 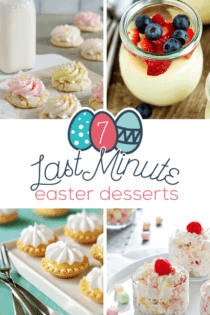 It was worth a try since I had about 3/4 of a cup left from a cake I made…If anyone else has any ideas what to do with that small an amt of left over fresh frozen coconut I’d love to hear it- since this may happen again! Thanks! I’ve never imagined of toasting coconut with the microway. I love them a lot, often use it for toping of my ice cream or like a snack. A favorite dessert of my wife an I is Buttermilk coconut pie. I have always just used coconut straight from the bag. 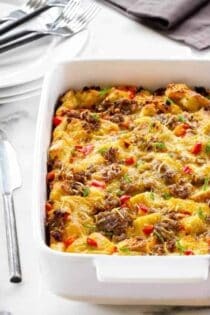 Will toasting the coconut work in this recipe? If I’d known it was this easy I’d have done more coconut toasting years ago! I always struggled to do it under the broiler and I was always scorching it. The pan method works like a charm! Thanks so much for stopping by, Victoria! I appreciate you taking the time to comment. Happy Baking! do you use is fresh coconut or dry coconut? You’ll want to use dry coconut. Hope this helps. Happy baking! Thanks so much for stopping by, Lucille! I appreciate you taking the time to comment. Happy Baking! I made a coconut cake and I used your help to toast the unsweetened coconut for the icing. Thanks so much for stopping by, Bob! I appreciate you taking the time to comment. Happy Baking! Be careful when you open the oven door-a bunch of steam hit me in the face and burned my eyes. But so easy and yummy!